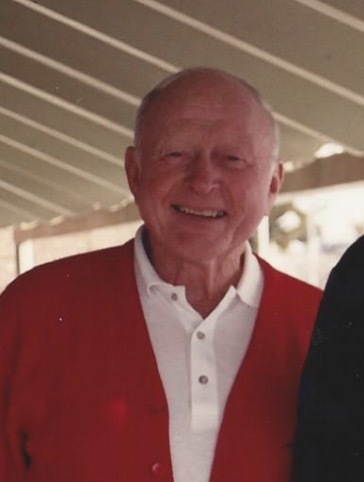 GRANTSVILLE - Leo “Skip” Johnson, age 89, passed away on April 7, 2019 of causes incident to Alzheimer disease. Skip was born November 13, 1929 in Grantsville, Utah. Son of Raleigh Johnson and Myra Jefferies. He is their only son with three sisters; Val (Roland) Smith, Colleen (Pat) Johnson, and Gay Zwahlen (Dal) Muir. Married Joan Rushton October 27, 1949 in Hunter, Utah. Skip’s greatest accomplishment in life was his family whom he loved dearly; two sons, Richard (Karen) Johnson, Neil (Cheryl) Johnson and two daughters, Jill (Bart) Van Dyken, and Gail (Todd) Savage. He adored each of his 10 grandchildren and 17 great-grandchildren. After 52 years of marriage Joan passed away in 2001 and in 2005 Skip married Barbara Williams. Skip graduated from Cyprus High School in 1948. His favorite sport was football and he received all-state honors and a scholarship to play football at the University of Wyoming in Laramie, WY. After returning from Laramie he started his career at Kennecott Utah Copper where he worked in the engineering department until his retirement 35 years later. Skip loved working on the farm, riding horses, raising cattle, and harvesting fields of alfalfa. He had many friends that he loved spending time and even with his struggles with Alzheimer’s he never lost his sense of humor. Preceded in death by his parents; wife, Joan; sister, Colleen “Pat”; two brother-in-laws, Roland Smith and Carl Zwahlen; and his best friend, Jay Hale. Survived by his wife, Barbara, four children, 10 grandchildren, 17 great-grandchildren, and two sisters. Services will be held Thursday, April 11, 2019 at 11:00 am in the LDS church, 81 North Church Street, Grantsville, Utah. A visitation will be held at the church on Thursday one hour prior to the services starting at 10:00 am. Interment will follow at Grantsville City Cemetery.